Dandelion | 15,000kms of Food! Went for a group dinner to Dandelion and chose to have the 7 course menu aptly named “The Sea”. 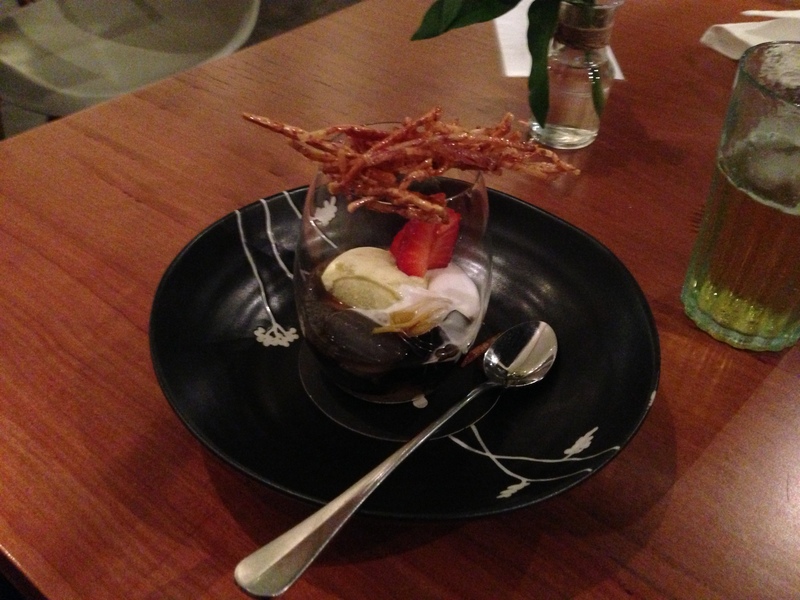 The description attached to the menu was “Vietnam has 3260 km of perse coastline. This menu is a seafood lovers dream. 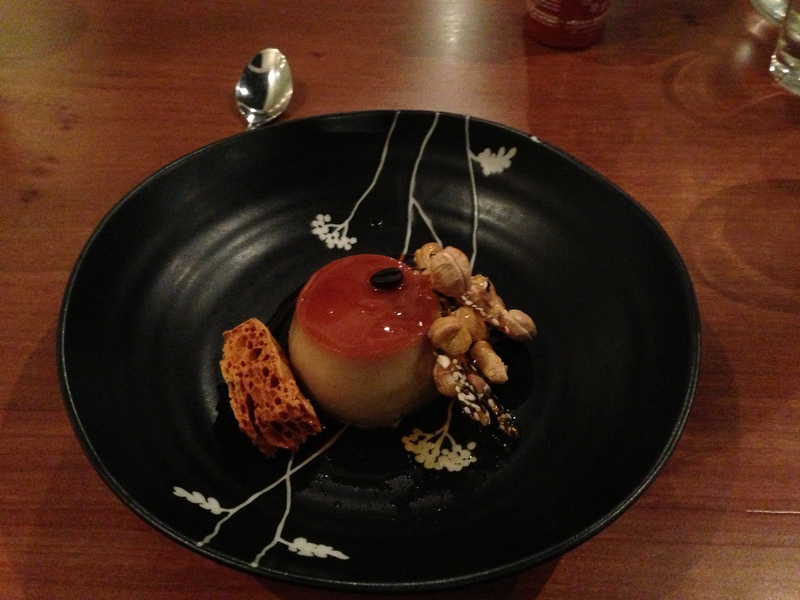 Luxury and quirky ingredients, simply and lovingly prepared”. As we are all foodie gluttons, we also opted to add “The Age Good Food Guide Dish Of The Year – BBQ Pork spare ribs with a refreshing lychee and mint salad” to this feast. I was so excited about that dish that I scoffed it down before I could get a picture! It was good, but I’m not sure if it warrants being the dish of the year. 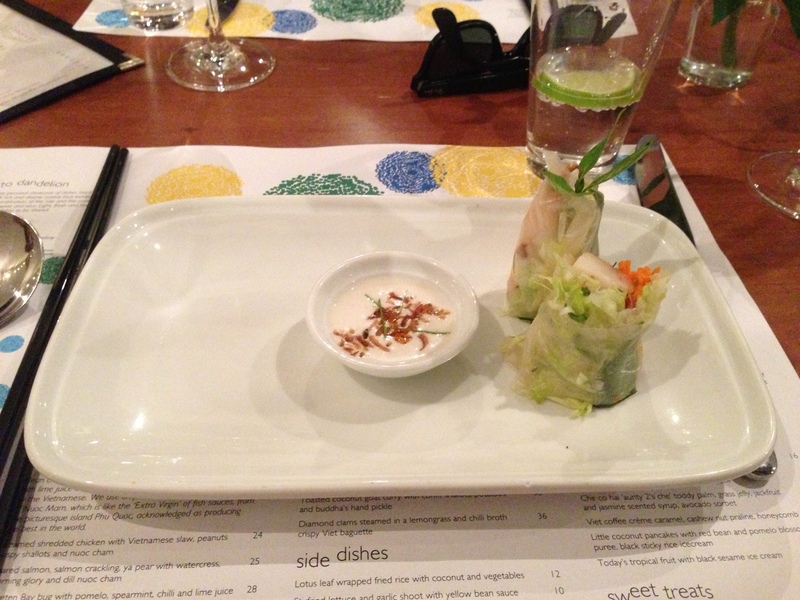 First up, we had “coconut roast rock lobster rice paper roll with rambutan and Thai basil, coconut chili sauce“. Was a fresh tasting entree. 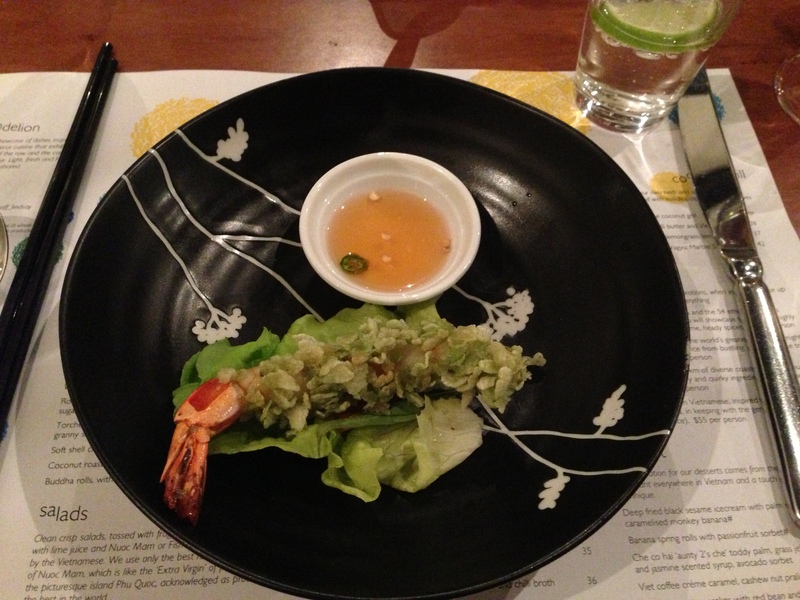 Next up was “green rice fried tiger prawns, butter lettuce and pickled daikon wrap, green chilli nuoc cham“. Crunchy and savoury. 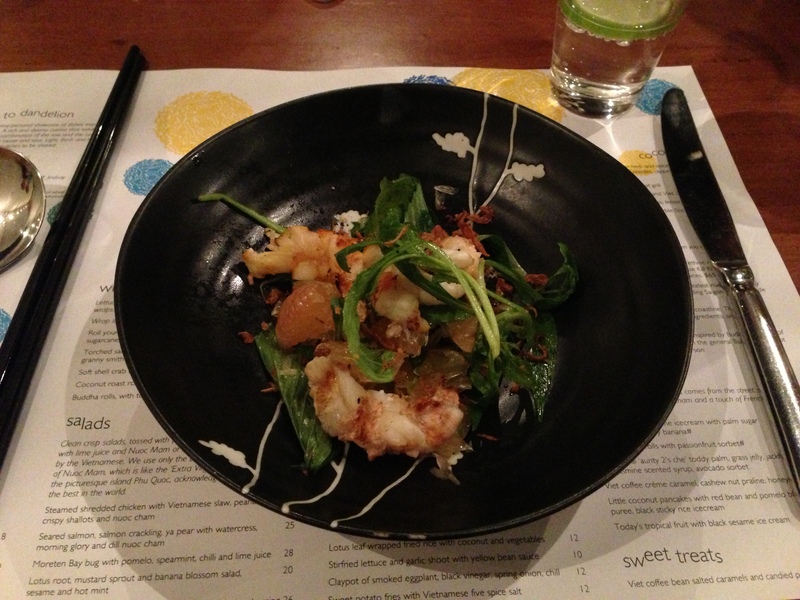 The “Morten Bay bug salad with pomelo, spearmint, chilli and lime juice” was delightful. This is a winning combo which can’t go wrong. The “diamond clams steamed in a lemongrass and chilli broth” was lovely. 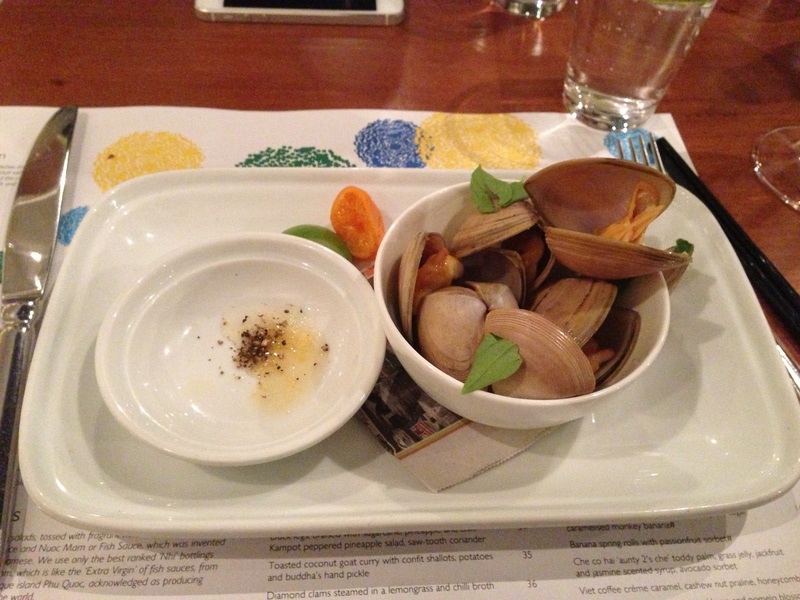 Clams were delicious. 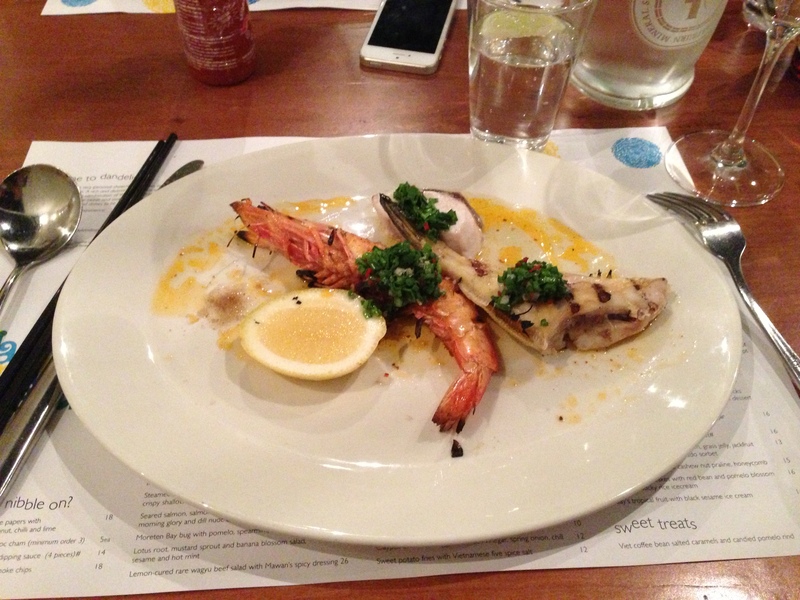 “Todays seafood selection from the coconut grill with our own herb and spice rub, wrapped with citrus leaves” was prawn and fish, which were both fresh and well cooked. 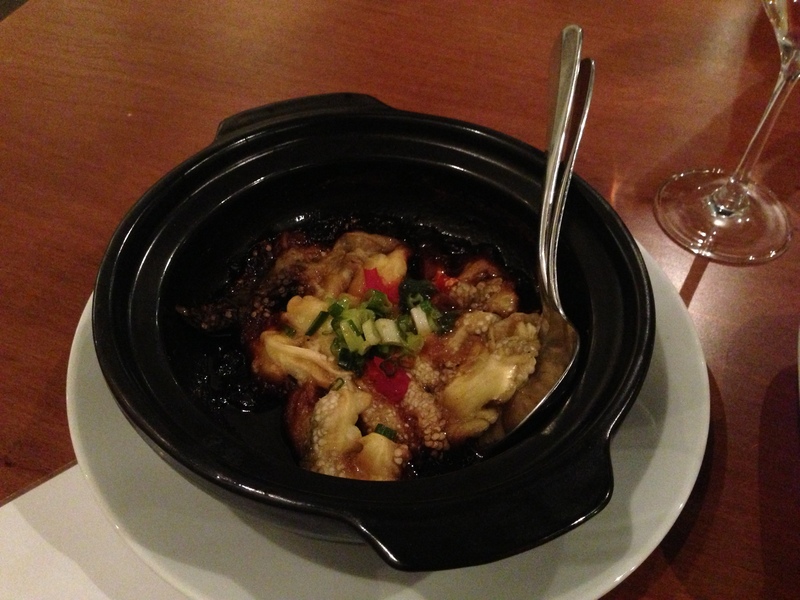 The last main before desserts was the “claypot of smoked eggplant, black vinegar, spring onion, chilli“. Mmmm I love eggplant and this dish was awesome. The description for dessert was “Che co hai ‘aunty 2’s che’ toddy palm, grass jelly, jackfruit and jasmine scented syrup , avocado sorbet” but we got two items. I’m not even going to try to figure out which was which. All I’ll say is that they were good, even though I’m not usually a fan of Asian desserts. Overall, food was good but if you’re after a substantial meal, go for something else. I have mixed feelings about this dinner. The seafood was fresh and aplenty, but it felt like there was something amiss. Perhaps that I didn’t feel the “lovingly prepared” that the meal had promised.